If you are reading this blog, it’s a pretty safe bet that you are an animal lover – or at least a dog lover. You may have a dog that you adopted from a shelter, purchased from a pet shop or a backyard breeder, or from a reputable, responsible breeder. Maybe your dog was a gift from a friend or a family member or a stray who showed up at your door and moved in. You believe, as I do, that every dog deserves a good home where he is loved and cared for properly. Why are there so many dogs without homes? Where do they all come from? You may be surprised by the answers. 2.5 – 3.5 M dogs enter shelters or rescues each year. 90% come from the 22% of pet dogs that are not spayed or neutered. Purebred dogs make up only about 25% of shelter dogs. Only 3-4% of all pet dogs are pit bulls but 29% of all shelter dogs are pit bulls or pit mixes. About 1.5 – 2 M shelter dogs are euthanized. About 60% of the euthanized dogs are pit bulls or pit mixes. There is no central data reporting system for U.S. animal shelters and rescues. Statistics will vary greatly depending on the region of the country. Animal shelters house homeless, lost, or abandoned animals, typically cats and dogs. The goal of the modern animal shelter is to provide a safe and caring environment until the animal is either reclaimed by its owner, placed in a new home, or placed with another organization for adoption. Some public animal shelters around the world euthanize animals that are not adopted within a set period of time (usually 1 to 2 weeks); others have a policy of only putting down animals that are in distress due to age or illness. Most private shelters are typically run as no-kill shelters. Most shelters will test the animals to see what type of home would be most suitable for living before they are placed for adoption. The most significant factor in the steady decline in shelter intakes is widely credited to the advancements made in spay/neuter programs. Nearly four out of five pet dogs are now desexed. Despite making up only 1 in 5 pet dogs, intact dogs account for 9 out of 10 shelter intakes, a staggering asymmetry. Human caused tragedy is so unnecessary. The graphic seems to indicate friends and family contribute to breeding the greater proportion of dogs compared to others. Sad that 90% of shelter dogs come from 22% of pets intact. That 29% of shelter dogs are pit bulls and pit mixes, also gives a bleak picture of pit bull pet ownership. 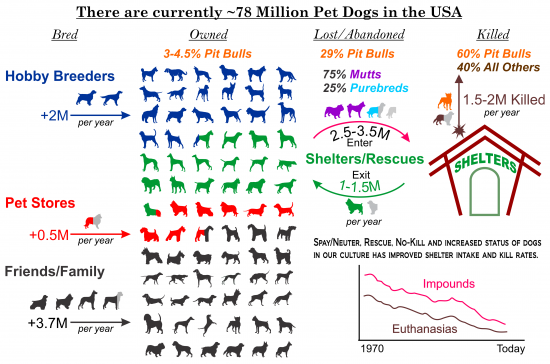 Despite only 2 – 3 % of pet dogs are pit bulls… this suggests to me that pit bull owners really need to address spay and neuter issues. The stats is surprising and I’m not sure how accurate or believable it is since I totally understand how the data will be spotty in these cases. It’s sad to see the numbers. The worst is that this 90% could be avoided, if some people would show more responsibility. I’ve been wondering where the strays come from at the shelter where I volunteer. Perfectly friendly, nice-looking dogs. Poorly trained maybe, but how do they wind up wandering a neighborhood where no one claims to know them?